This thoughtful magnet is perfect for your frig, file cabinet, or metal bookcase. 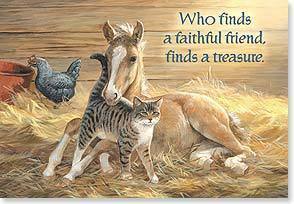 Verse says "Who finds a faithful friend, finds a treasure." * Artist: Persis Clayton Weirs * Size: 3.25 x 4.75 inches * Flexible, flat, and lightweight * Perfect for mailing in a greeting card * Made in the U.S.A.